IF YOU aren’t on the property ladder by 35 then you could be paying off your mortage with your superannuation, a property expert has warned. The stark statement comes as figures show the wealth gap between generations is widening with home ownership among young Australians falling to the lowest level on record. Startling Grattan Institute statistics show wealthy people aged 55-64 are the only group which has seen its home ownership rates increase over 30 years. 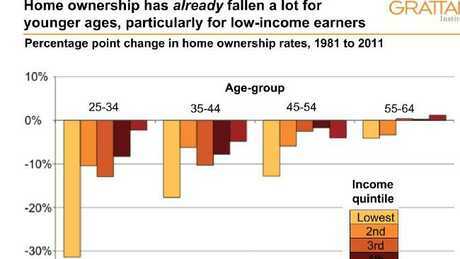 The biggest falls in ownership have been suffered by the young people aged 25-34, who saw their home ownership rate drop by more than 30 per cent from 1981 until 2011. Only 45 per cent of them own their own homes. This is down 16 per cent from the 1980s, with almost half the decline coming in the past decade. And, if the government doesn’t do something to help younger people own homes, there will be “stark differences” between the “haves and have-nots” in the near future, warns a leading housing policy expert. The alarming findings come after Sydney held its title as the second-costliest housing market in the world, in this year’s Demographia International Housing Affordability Survey. Research by Finder.com.au shows that even Sydney’s ‘bargain’ suburbs that were $500,000 or cheaper in 2012 have nearly doubled in value in the past five years. While Melbourne, ranked the world’s most liveable city the past seven years by the Economist Intelligence Unit, is now the planet’s sixth-most expensive place to buy a house. Brendan Coates, a housing policy expert at the Grattan Institute, said the issue of young people being locked out of the property ladder is one which will take at least two decades to fix. “Reforming negative gearing and capital gains tax, which have added fuel to the fire, would be a good start but it would only lower prices by about two per cent. “It’s not about how many homes we build this year or next year. We would need to see at least a decade of sustained home building to make a big difference. “If Australians are not on the property ladder by the time they are 35, then it is unlikely that they will own their home outright,” he said. He added soaring property prices are a major factor behind the rapidly growing wealth of older Australians. “Households headed by 65-74-year-olds were on average $500,000 wealthier in 2015-16 than households in the same age group 12 years ago,” he added. According to the ABS, house prices grew by 37 per cent on average across all the capital cities between 2003-04 and 2015-16 and by more than 50 per cent in Melbourne alone. 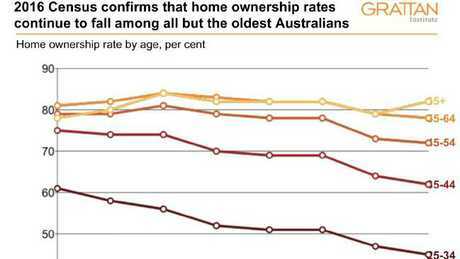 However, Paul Dales, chief Australian economist at Capital Economics said the age gap in home ownership is not all bad news for the Aussie economy. “There are a lot of social issues which come out of young people not being able to afford their own homes, but for the economy – there’s not one clear answer to say whether it’s good or bad. “One one hand, young people are spending so much of their income on mortgage repayments or on rent that they have far less money on other things. “More money going on servicing a mortgage means there is less to spend elsewhere, dragging on economic growth. “But, there are some offsets to this. The older homeowners have seen their family homes have soared in value and, as a result, they have more wealth to spend on other things. “We also see a lot of young people living with their parents so they can save for a deposit for a home, and they are put off by renting because it is so expensive. life before starting work, forming long-term partnerships, and having children, Mr Coates said. “But most Australians still want to own a home, so it is reasonable to conclude that higher property prices are the biggest cause of lower ownership rates,” he said. A Grattan spokesman said the only way young people can afford to buy a house is with help from “the bank of mum and dad”. “Inheritances tend to transmit wealth to children who are already well-off, and home ownership is more likely among those who receive an inheritance, and more likely still among those who receive larger inheritances,” he said.